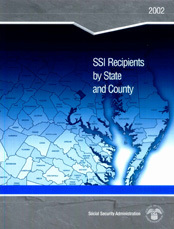 The SSI program is a cash assistance program that provides monthly benefits to low-income aged, blind, or disabled persons in the 50 states, the District of Columbia, and the Northern Mariana Islands. The states and other jurisdictions have the option of supplementing their residents' SSI payments and may choose to have the additional payments administered by the federal government. When a state chooses federal administration, the Social Security Administration maintains the payment records and issues the federal payment and the state supplement in one check. The data presented in this document are for federal and federally administered state payments only. State-administered supplementation payments are not included. The tables present SSI data by eligibility category (aged, blind and disabled) and age. State data on the number of recipients and amount of payments are shown in Tables 1 and 2, respectively. SSI recipients who also receive Social Security (Old-Age, Survivors, and Disability Insurance) benefits are shown in Table 1 and also in Table 3, which presents data at the county level. The data are drawn from the 100 percent SORD file. State totals shown include a small number of recipients not distributed by county. To avoid disclosure of the reason for individuals' eligibility, data on eligibility categories are suppressed for counties with fewer than 15 recipients or where all recipients are in the same category. The amount of payments is not shown for counties with fewer than four recipients. Stella M. Coleman in the Division of SSI Statistics and Analysis programmed and compiled the data for this report. Emil Loomis designed the cover, Celine Houget edited the report, Kathryn Winstead provided final production assistance, and Laurie Brown prepared the electronic versions for the Web.